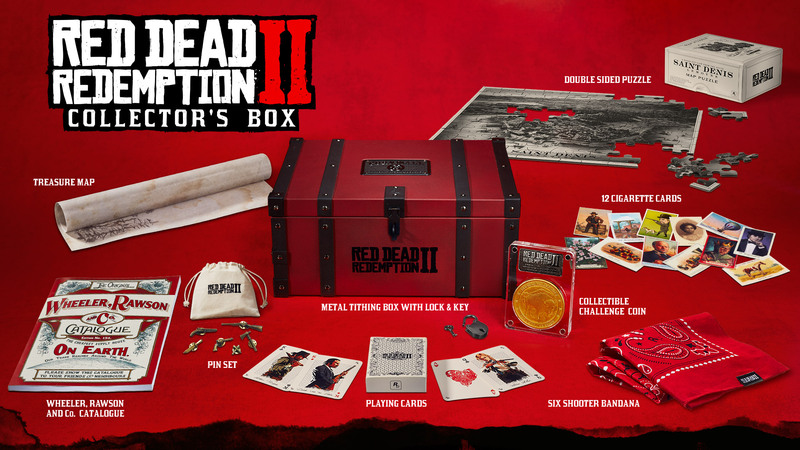 Greetings Space Cadets, Rockstar Games have announced details for the Special Edition, Ultimate Edition, and Collectors Box of Red Dead Redemption 2. Treasure Map: Secret buried treasure can be found throughout the world of Red Dead Redemption 2. 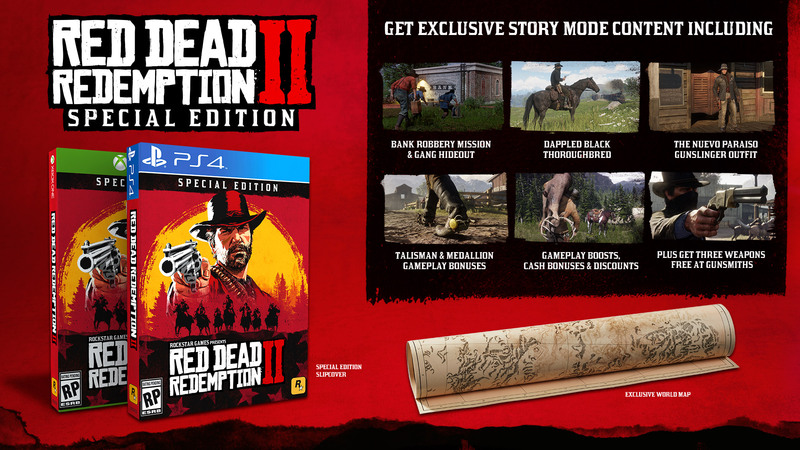 This exclusive Treasure Map for Story Mode will give Arthur a head start on the hunt for hidden riches. The Nuevo Paraiso Gunslinger Outfit: This exclusive Story Mode outfit for Arthur is inspired by the clothing worn by vaqueros and banditos south of the border. The outfit features a wide-brimmed black cowboy hat, deep indigo coat, worn denim chaps, leather gloves and boots. Bonus Outfits: Get two exclusive outfits for your online character. The Blackrose Bounty Hunter Outfit features a long oxblood-coloured coat, a vest with gold pocket watch chain, and dark pants tucked into chocolate leather boots. The Copperhead Enforcer Outfit features a fur-lined saddle-brown leather waistcoat, two-tone gloves, and pinstripe black pants tucked into black leather boots. 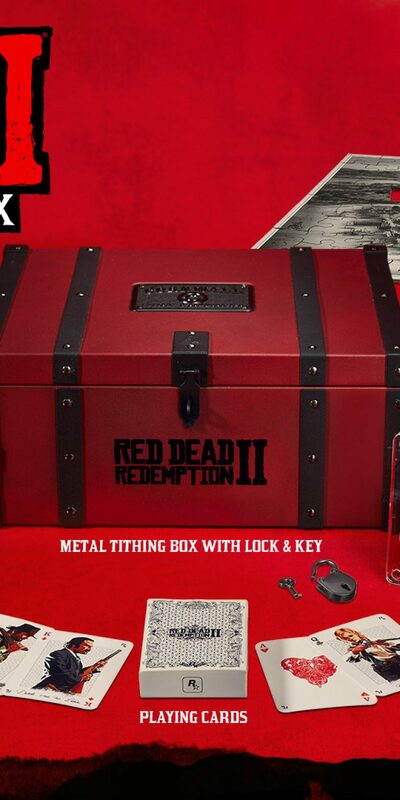 The Red Dead Redemption 2: Collector’s Box, available exclusively from select retailers and the Rockstar Warehouse, features a curated assortment of outlaw essentials all packaged in a thick-gauged metal tithing box (Red Dead Redemption 2 sold separately). Collectable Challenge Coin: Featuring the majestic American Buffalo on one side and a scenic landscape on the other side, this engraved, the gold-coloured collectable coin comes in a magnetic presentation holder with a black, engraved plaque describing the history of this endangered species. Double Sided Puzzle: This double-sided, 100-piece wooden jigsaw puzzle features an illustrated view of the bustling port of Saint-Denis on one side and a classically inspired Rockstar Games logo on the reverse. 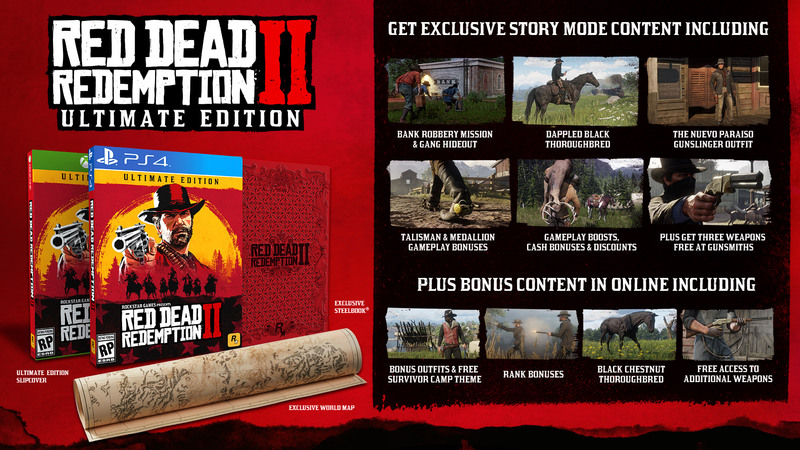 Treasure Map: Printed on durable, un-rippable paper, this exclusive treasure map reveals the location of some buried treasure that may start Arthur on a search for more riches hidden throughout the world of Red Dead Redemption 2. 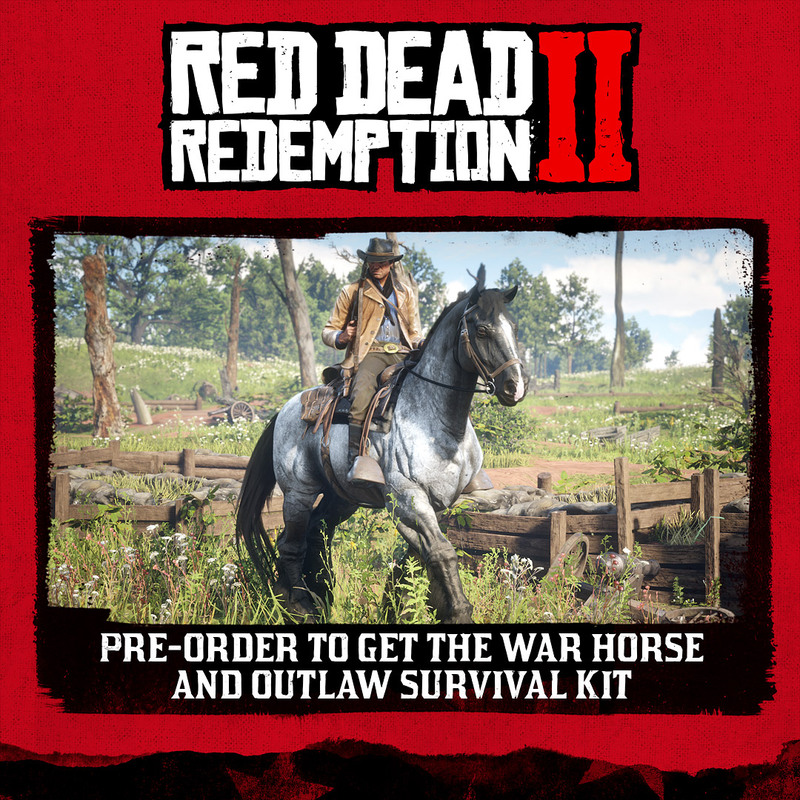 Red Dead Redemption 2 Pre-Order Collectors Editions Reviewed by DR Ravenholm on June 7, 2018 .